This delicious variety boasts a Cannabis Cup trophy. It is a Haze variety, marking it as a very strong Sativa. It is also a skunk variety, having all the deep, potent strengths of skunk weed as well. It is often prepared with a coating of kief and has the taste of sweet Lemon-head candies. This strain was introduced by Green House Seeds. 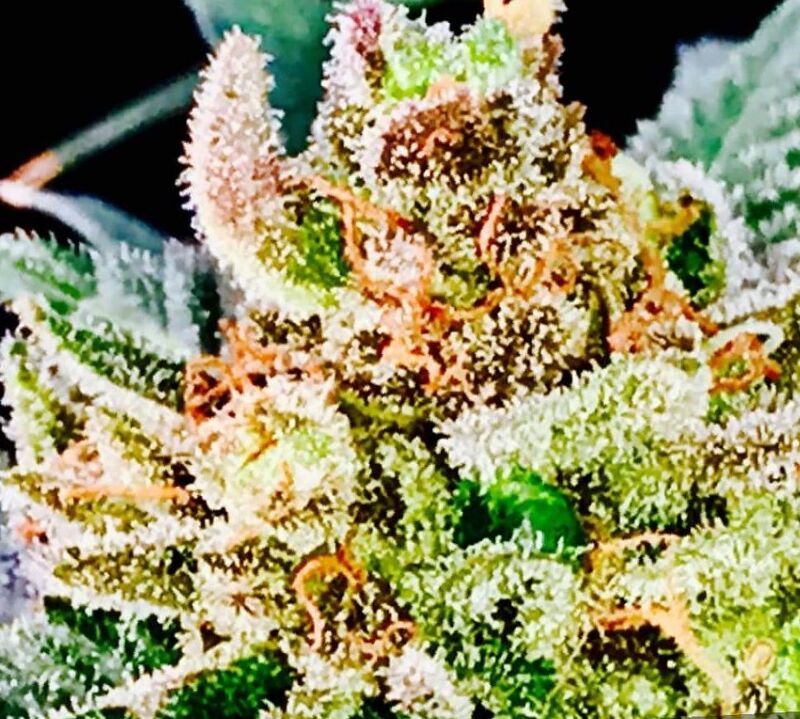 Aromas, Flavors Super Lemon Haze has fragrances and aromas that revolve around the mouth-watering, lip puckering, lemon taste. Super Lemon Haze has tastes of lime, citrus, spiciness, tanginess, candy, and earthiness. May Relieve Super Lemon Haze buds are a Sativa plant with as much as 22% THC. This makes it effective against musculoskeletal pain like back pain and neck pain, neuropathic pain like fibromyalgia, and inflammatory pain like migraines. It can also be effective against anxiety disorders, ADD, and ADHD. Super Lemon Haze can also treat nausea and lack of appetite. 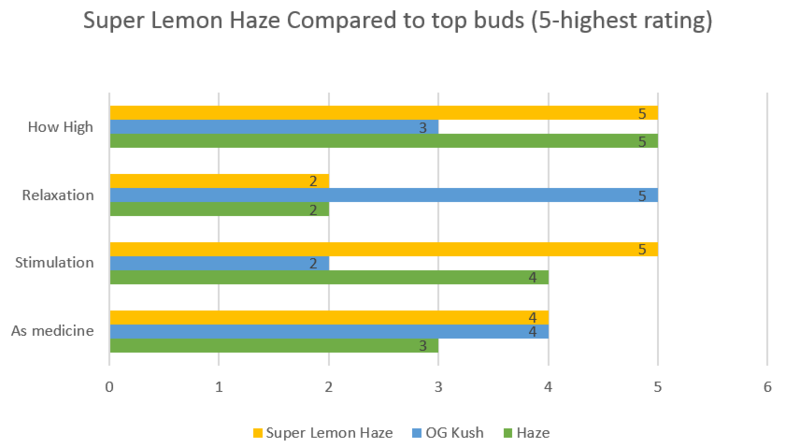 Indoor/Outdoor Yield For cultivators who grow Super Lemon haze indoors, yield can be up to 28 ounces per meter squared. Grown outdoors, cultivators can expect 35 ounces per plant of lemony sweet weed. Flowering time Super Lemon Haze plants will flower in nine to ten weeks and be ready for a delicious harvest. 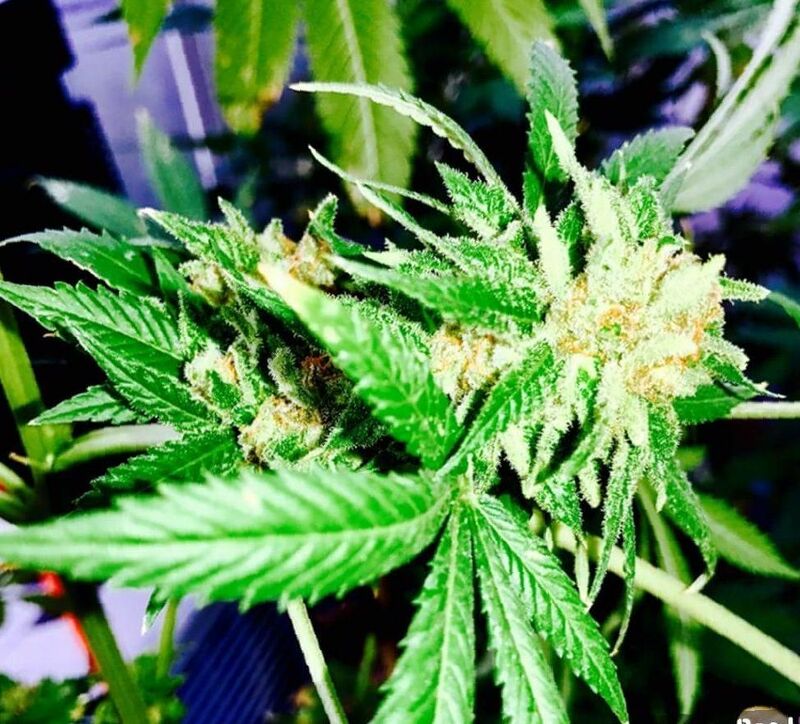 Harvest Super Lemon Haze will be ready for harvest at the end of the month of October. 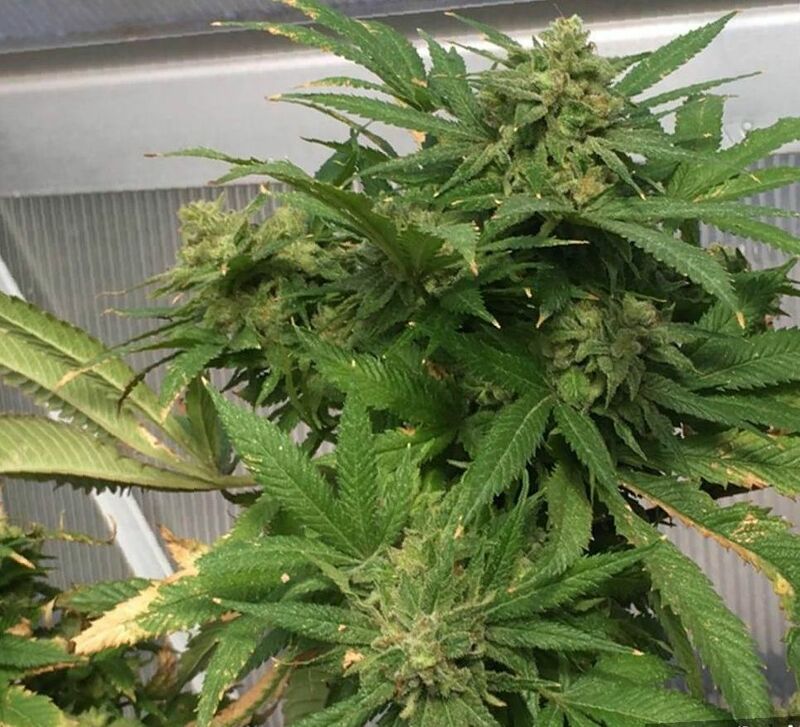 Disease resistance Super Lemon Haze cannabis has high resistance to disease, including mildew, mold, bacteria, viruses, fungus, and mechanical damage. Plant Height Super Lemon Haze marijuana grows from a medium to tall size. Adverse effects Super Lemon Haze marijuana has few side effects. Its powerful Sativa genetics can lend itself to the side effect of dry mouth and rarely, dry eyes. Growing difficulty Growing Super Lemon Haze plants are an easy to moderate undertaking. You will need basic gardening skills and patience. Trimming, staking, screen of green, knowledge of fertilizers, and knowledge of hydration practices may be useful skills. Super Lemon Haze is the brainchild of Green House Seeds. It has gone on to garner a Cannabis Cup, marking it as one of the most exciting and beloved Sativas out there. It combines Haze and Skunk genetics, taking the best aspects of each genetic lineage. It is a native of Washington state. It is most popular on the West Coat of the United States and Canada. This is a strong Sativa variety with low CBD levels. However, it is often used as a medical strain for its ability to invigorate the mind and treat issues such as depression and sometimes anxiety. The strong Sativa kick can make it easy to tip over into anxiety and paranoia for those who are prone to those issues. Recreationally, this Sativa is enjoyed as a pick-me-up, like a cup of coffee but better, as it does not bring on a crash like coffee does. It has no quick let down, but simply slips away leaving you feeling satisfied and inspired. Super Lemon Haze is a favorite of the artistic community. The Super Lemon Haze plants are tall, as much as 80 inches. Sometimes prepared with a sprinkling of kief, it has bright green leaves, bright orange pistils, and a coat of sticky resin crystals throughout. Super Lemon Haze is renowned for its lemon smell and taste, which is also described as lime, sour, sweet, citrus, spiciness, green, earthy, pine, and oak wood. The fragrance of Super Lemon Haze will quickly fill a room. It is certainly the first thing one will notice about this weed. As soon as you take a whiff of it, you will smell the power coming from the plant. That lemon smell is said to be caused by d-limonene, the same chemical that creates that smell in lemons. It is said to have some therapeutic properties of its own. But it definitely marks the plant with a strong smell as a healthy and powerful plant, so you can be sure the experience to come with be worthwhile. Growing weed from Super Lemon Haze cannabis seeds and cuttings is thought to be fairly easy. These hearty plants are resistant to pests and diseases. Adding extra nutrients with a good fertilizer like Flower Power can improve yields. These plants prefer to grow indoors, in a climate that mimics a sunny Mediterranean climate. Indoors, delicious Super Lemon Haze plants will fill the room with a nice lemon pine scent and take nine to ten weeks to flower. These plants will yield up to 28 ounces of strong Sativa bud per meter squared. Outdoors, Super Lemon Haze will grow in a sunny Mediterranean climate. These plants will yield a whopping 35 ounces per plant of sweet lemon bud. These are fairly high yields, especially for a plant with such high THC levels. These high yields make Super Lemon Haze a very valuable and profitable Sativa. If you mare producing these plants for legal sale, you will surely be rewarded by including Super Lemon Haze in your collection. Quality Sativa varieties are very popular, and they provide an alternative for those who want to smoke marijuana to treat various illnesses and still be able to get up and go to work and be productive. Super Lemon Haze is the weed strain that will release you from pain and at the same time allow you to fulfill your dreams. Super Lemon Haze medical cannabis has THC levels as high as 22 percent. This makes it an effective pain killer. It can tackle musculoskeletal pain, such as back pain, arthritis, sciatica, neck pain, muscle spasms, and muscle cramps. It can help with migraine headaches. Super Lemon Haze can be a fun way to relieve acute pains from sprains and minor scrapes and bruises, either used by ingestion or topically. Super Lemon Haze medical marijuana can also help to tackle neuropathic pain. Neuropathic pain is pain which is caused by damage to the nerves that send signals to the spinal cord and brain about the body. Sometimes, in the absence of damage to the body, pain signals will be sent because the nerves themselves are damaged. This is neuropathic pain and Super Lemon Haze marijuana can help block these errant pain signals in such conditions as fibromyalgia, Multiple Sclerosis, and shingles pain from a later outbreak of Herpes Zoster also known as the Chicken Pox virus. It can also help ease pain from peripheral neuropathy which can be a complication of diabetes. These pains can present as burning, itching, tingling, or prickling pains. Super Lemon Haze marijuana can help treat nausea. Nausea can be caused by treatments for cancer like chemotherapy and radiation, by dysautonomia, or appear without obvious cause. Medical cannabis can offer a route of administration which is particularly helpful since it does not have to be swallowed by those experiencing extreme nausea. Rather, they can smoke or vape the medicine and get the full effects. Super Lemon Haze can be used to improve appetite. It starts with the sweet lemon taste the user is sure to enjoy. It will then bring on a case of the munchies that will allow the user to take in adequate nutrition to gain back the weight that has been lost due to illnesses which cause wasting. You will have a healthy and enjoyable time eating your fill after you have used this medicine to improve appetite. Super Lemon Haze, though it is a Sativa with high THC levels, still has anti-inflammatory properties. Inflammation has been implicated in many diseases from heart disease to diabetes and depression. Anti-inflammatories help ramp down swelling and inflammation and can help save internal organs from being damaged. 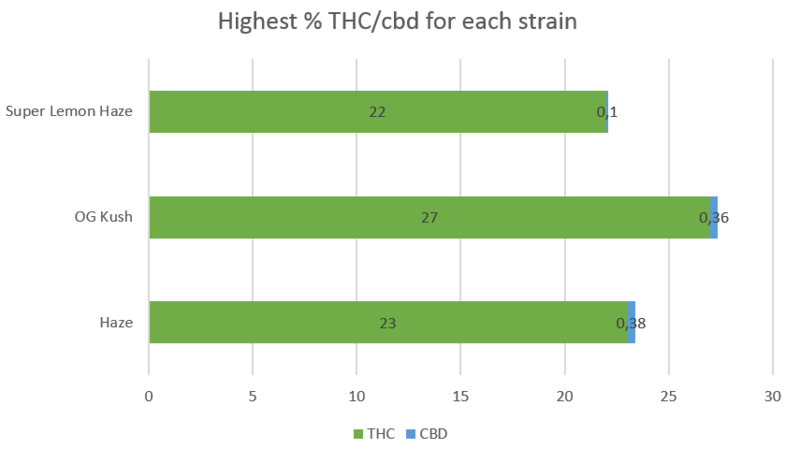 The anti-inflammatory properties of cannabis are just recently being discovered and studied but scientists are impressed and initial results are promising. The anti-inflammatory effect can be part of what makes medical cannabis effective in some types of seizures as well as in conditions like Multiple Sclerosis. Super Lemon Haze is a Sativa that will first give you a mouthful of deliciousness. As the effects come on, you will feel all the stress and aches and pains from the day dissolve. You will be left with a feeling of energy and pleasure throughout the body. You will want to engage in active activities such as conversing with friends on important topics, doing artwork such as painting, or making music. The energy you feel may be the perfect compliment to a romantic evening, as you will be blanketed in the warmth of the pleasurable wave washing over your body. This may make you extra affectionate to your partner. It will be an evening where the two of you will appreciate each other more and enjoy each other’s company without a hint of annoyance. Super Lemon Haze will give you the munchies, so it also goes well with a thoughtfully prepared dinner with friends and family, or a romantic partner. The food will taste better, and the conversation will be more thoughtful and better appreciated. Unlike many Indicas, Super Lemon Haze won’t put you to sleep or give you couchlock. It will give you the energy and creativity to engage in life rather than slipping away from it. This is important as it will allow you the space to tackle the source of problems which affect your health. For example, if you need to exercise to improve your health, you can very well be motivated to take a jog and do some pushups while on this energizing Sativa. You will be motivated to cook healthy meals and learn to enjoy a healthy lifestyle while using this medication, rather than sinking into the couch and snacking on unhealthy food.